Can anyone over 30 participate? You bet! QMA exists to provide the opportunity for all mature age people to experience the buzz that athletics provides - why should the kids have all the fun?! We have all standards joining in from beginners to world champions, and everyone is there to help. No problem, you have several options to dip your toe in the water before registering. Join in with a scheduled training session in your area - search for details of regular sessions in each region under About Us. 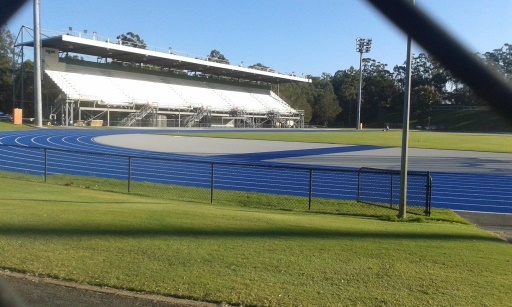 Or just attend a local track meeting to have a look around, and when you feel ready come along to compete as a visitor. You can compete 3 times before being required to register as a QMA member. Training often only involves a minimal track fee of approximately $5.00, but specialized coaching may involve extra fees. Registration as a QMA member currently costs $65.00/$55.00 concession per season (unless you live in North Queensland - see the Membership Page for more detail) which also provides you insurance through Queensland Athletics. On competition days a track fee of approximately $7.00-$8.00 (depending on the venue) applies for as many events as you like to enter. Championships costs vary, and may have a requirement to wear the QMA uniform, available for purchase from QMA - more information can be found on the Uniform Page. Track and Field competition seasons vary depending on your location in the state. In the southeast Brisbane mostly competes from October to early April, but the Gold Coast holds track and field meets throughout the year and North Queensland (sensibly!) run most of their competitions through the winter months. Check the Calendar for details.